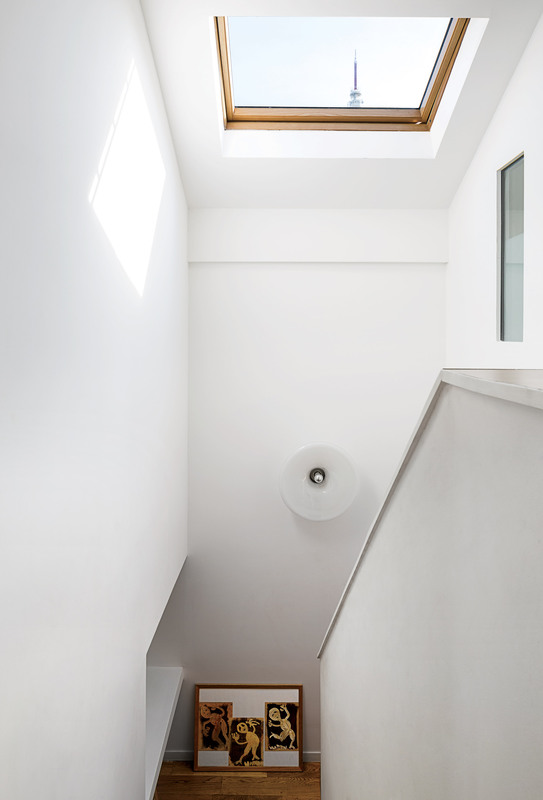 The antenna of Claude Vasconi’s TDF television tower is visible through the Velux skylight architects Caroline Djuric and Mirco Tardio added to a family house in France. “It’s very French, very angular,” Djuric says of the renovation. The light fixture was found at a brocante, or vintage market. A shift in material on the facade, from concrete to red cedar, delineates old and new spaces. In the living area, a 2010 Vertigo lamp by Constance Guisset hangs above a 1974 Gijs Bakker Strip table; the residents believe the floor lamp in the foreground is Murano glass. Dark panels of metal, left behind by the previous homeowners, were stored outside until a rich patina developed. Now they hide a library. The back of the house was designed as a contemporary counterpoint to the more traditional front facade. The sliding doors and windows are by Technal. An asymmetrical wooden stairway leads down to the garden. A cedar-clad door in the front provides a shortcut to the backyard. Les Lilas, a leafy, sleepy suburb on the eastern fringe of Paris, is an identifiable part of the city’s skyline thanks only to Claude Vasconi’s giant mushroom-shaped TDF television tower. 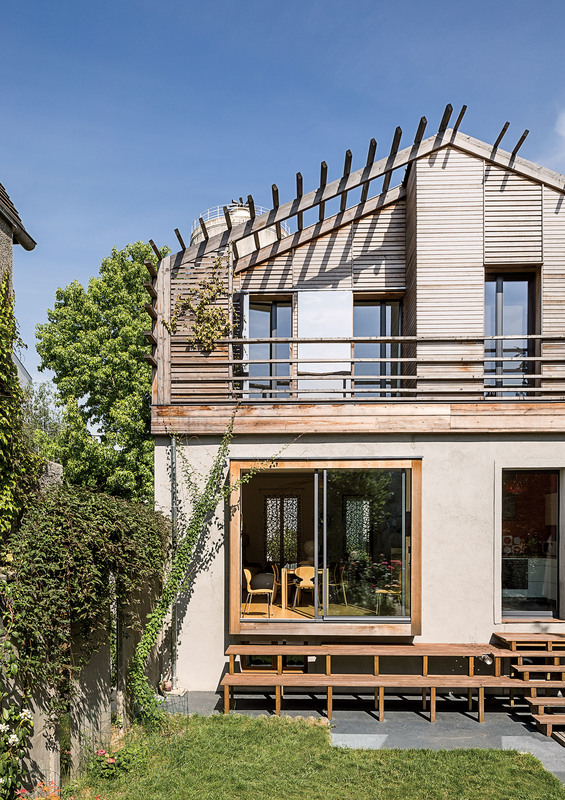 On a narrow block lined with anonymous apartment buildings and small brick homes stands another modern addition to the banlieue: a cedar house that appears to be growing happily out of a squat box of gray concrete. The design is by Caroline Djuric, cofounder of Djuric Tardio Architectes, a Paris-based firm that specializes in sneaking cutting-edge ecological ideas into the city’s existing urban framework—much of which is reinforced by ironclad zoning restrictions and a strong sense of tradition. But Djuric is not one to bow to the status quo. In Antony, a densely populated suburb located to the south of the city, she and her partner, Mirco Tardio, built an award-winning prefabricated house that was assembled in just two weeks. 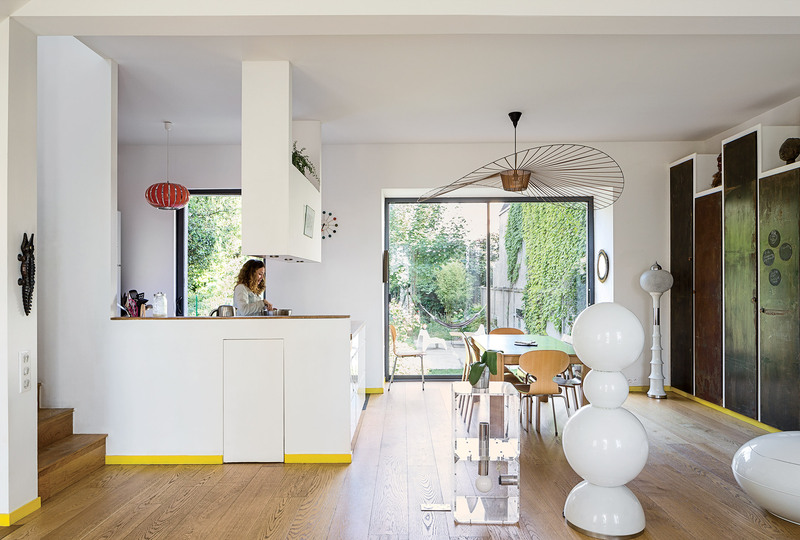 Its roof is pitched like the homes surrounding it but is composed of open slats, letting in light and rain to nourish a suspended garden filled with grapevines, summer squash, and kiwifruit. Even more radical than Djuric’s and Tardio’s current projects are their ideas for future ones, such as the spiraling wooden tepees that they propose to build in small parks throughout the capital to house day-care centers, adding value to green spaces in neighborhoods where empty lots are nonexistent. The project in Les Lilas involved the usual spirit of ingenuity for this firm accustomed to creating adventurous designs within strict limits. To accommodate a family of four without running afoul of zoning rules, an existing brick house would nearly double in size (to a little over 1,600 square feet) with only a slight extension of its footprint. “We chopped off the head of the house,” Djuric says, “and created a new top floor made of pine.” The extension’s walls were constructed from prefabricated panels, which cut down on costs, keeping the project within its budget of approximately $280,000. It was important, Djuric says, that the seam connecting the existing house to the extension be “legible.” The house’s facade blends in with the rhythm of the street, while the result is more contemporary in the rear, with wood projecting from the slatted roof, tempering any traditional connotations of the building’s silhouette. This modern profile backs out onto a wild garden, reachable via an asymmetrical wooden stairway topped by a platform. The backyard offers a full picture of Djuric’s handiwork—the sliding reflective panels that give off abstract effects and shaded larch reading nooks covered in plant life. The pine extension, with its cedar siding and wood-wool insulation, conserves heat in winter. In summer, the pergola and climbing vegetation act as a kind of sunscreen, keeping the house cool. The structure is appealingly framed on either side by two distinctive features of the local skyline: Vasconi’s futuristic TV tower and a concrete water tank.